Prof. Mich Kabay in his regular column in Network Security had some interesting statistics about enforcing security policies for workstations. Last month, Network World had a review of Network Access Control (NAC) tools, a related area. 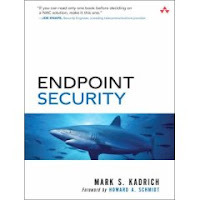 And, then, recently a new book, Endpoint Security by Mark Kadrich, came out on the subject. Endpoint security and NAC has been a hot topic since workstations are now seen as the weakest link in many company's IT security. Even with firewalls, the right application attack can sail right through, land on a desktop and wreak havoc. Some more Endpoint security news: There's a new Endpoint security freeware tool that was released by GFI. The tool checks what devices are or have been connected to computers on a network and by whom. It's basically a diagnostic tool that tells you where on your network the use of portable storage devices could pose a risk.